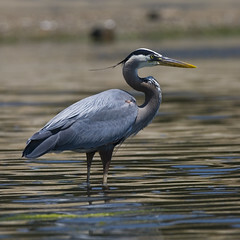 There is a Great Blue Heron nesting in the scrub across the channel opposite our dock. I know this without looking because each morning at dawn it lets forth with a single Jurassic squawk. This is not a pleasant, calming sound, even for a budding ornithologist. Doves, ducks, seagulls and owls make calming sounds. Heron-song is a primordial screech that reaches deep into the lizard brain and pumps a shot of adrenaline through the recumbent human body. Worse, our neighborhood is so quiet in the wee small hours of the morning that the surfline on the far side of the dunes is comfortably audible. A single prehistoric bleat at 4am sound like the the hunting cry of a pterodactyl. This is not a sound that endears. It is a sound that can almost tempt a man to defy wildlife protection laws and his very nature, especially after the thirtieth night in a row that his sleep has been so interrupted. I’ll learn to live with it, I’m sure, but I have a new-found sympathy for those who make sacrifices on behalf of our collective accommodation with nature. of the future and eventual fate of one of Southern California’s most defining man-made features: the freeway system. The rising cost of petroleum, Angelenos’ growing acceptance of mass transit, and a gradual rise of a new California lifestyle that places sustainability ahead of mobility could mean that SoCal’s reliance on the automobile has plateaued. Dutton’s manifesto begins with a call to abandon the car as a dysfunctional element of our lifestyle, introduces the idea of a a “Slow Move” future to go alongside our presumed “slow food” future, and then lays out the implications for urban planning and lifestyles. The car, Dutton suggests, has dominated our city for too long. It is time to approach things another way. By shifting to an integrated, hierarchical network of sidewalks, bike paths, light rail, and subway networks beneath the greenways that take the place of freeways, the study suggests we can claim a lifestyle in keeping with our ideals and our climate. As with many such studies, there is an thick band of utopianism woven throughout this picture. 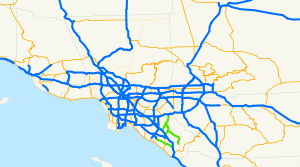 Southern California has been zoned, built, lived, and governed with the car at the center. 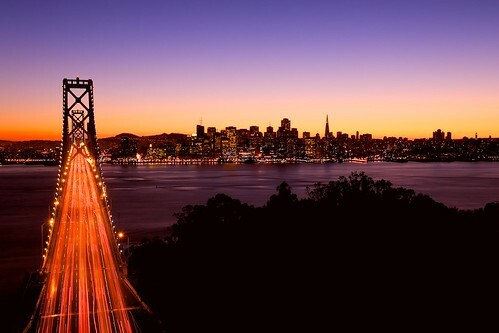 Changing that means changing much more than repurposing freeways, and thus it presumes either a burst of instant national enlightenment or a cataclysm (economic or environmental) that will convince Californians that they no longer have a choice. Yet such criticism is somehow unfair, as it presumes more than what the study was intended to offer. Dutton’s team is proffering a vision of the post-automotive city that can be in many ways better than what we have, not worse. It is not a roadmap on how to get to that future. I’m not ready to buy yet, but I wish more of California’s planners and architects would pursue such innovative thinking. It might just get us someplace. 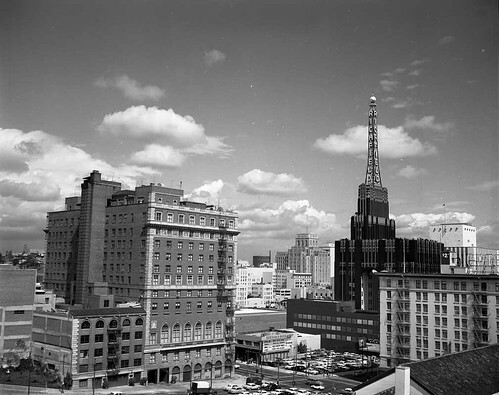 Downtown Los Angeles, a photo by Manitoba Museum of Finds Art on Flickr. 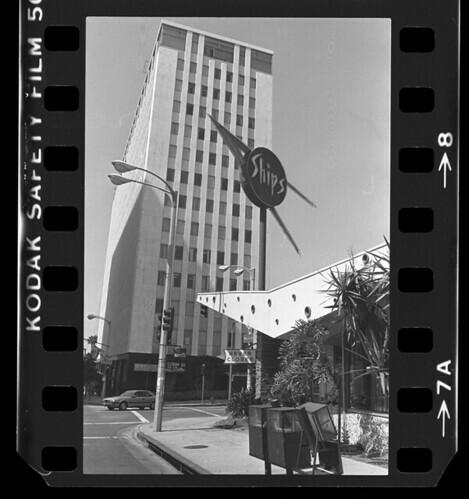 Beneath the mesh radio tower in the right center of the picture is the Richfield building, the erstwhile headquarters of Richfield Oil of California. Richfield was incorporated in 1905 and opened its first service station at Slauson and Central in Los Angeles in 1917. The building in the photo, a black and gold art-deco masterpiece, was completed in 1929 on the cusp of the Great Depression. Richfield would bounce between receivership and prosperity during the 1930s, and in February 1942 had its Ellwood Oil Field in Santa Barbara County bombarded by the Japanese submarine I-17. The company prospered with the war and the following boom, becoming one of the launch sponsors at Disneyland and discovering Alaska’s first major oil field. The merger boom of the 1960s, however, would see Richfield combined with Atlantic Petroleum, becoming Atlantic Richfield and later ARCO. The headquarters building, an architectural jewel in the tiara of the downtown skyline, was demolished in 1968. Just as sad and permanent, ARCO’s purchase by BP, and its pending sale to Tesoro, removed yet another headquarters from Southern California. Ships, Westwood, 1984, a photo by jericl cat on Flickr. There are bits of history that should never be forgotten, and high among those are the bits that went into our bellies. My first hamburger was a quarter of a Ship Shape burger taken out from Ship’s Westwood years before McDonald’s showed its face in West Los Angeles. The quasi-streamline-moderne architecture, the neon, and the unrepentantly retro fixtures, along with a San Francisco-style hamburger on sourdough instead of a bun, made this place iconic. I think about it every time I drive past the intersection of Wilshire and Glendon.